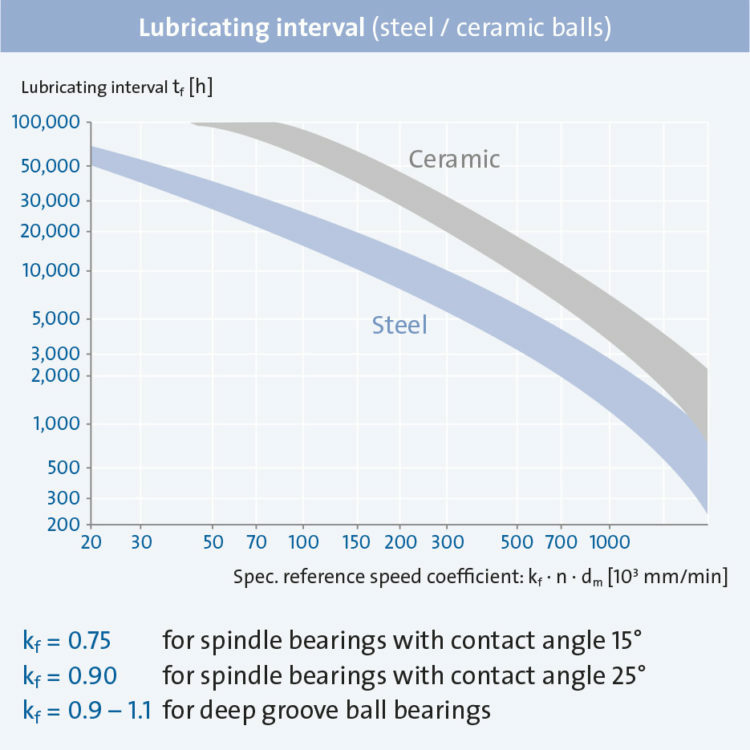 The selection of suitable lubricants relies primarily on the bearings’ maximum operating RPM. 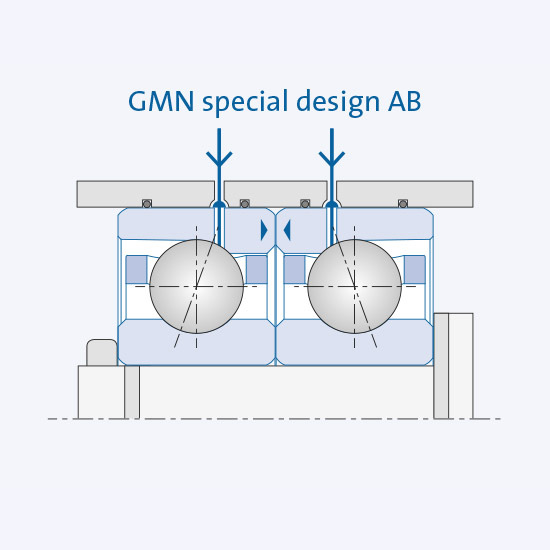 In order to optimally use the performance of GMN high-precision ball bearings in machining operations, one must pay particular attention to suitable bearing lubrication. The highest-possible RPM as well as maximum life expectancy are based on lubricant film formation that reduces friction between rolling and sliding bearing parts. The suitability for very high speeds of modern high-speed greases allows the increasing use of application-friendly and economical advantages of grease lubrication. Operating requirements which exceed the performance of lubricating greases provide oil-lubricated bearings with maximum service life in the highest speed and temperature ranges. The selection of suitable grease lubricants relies primarily on the bearings’ maximum operating RPM. 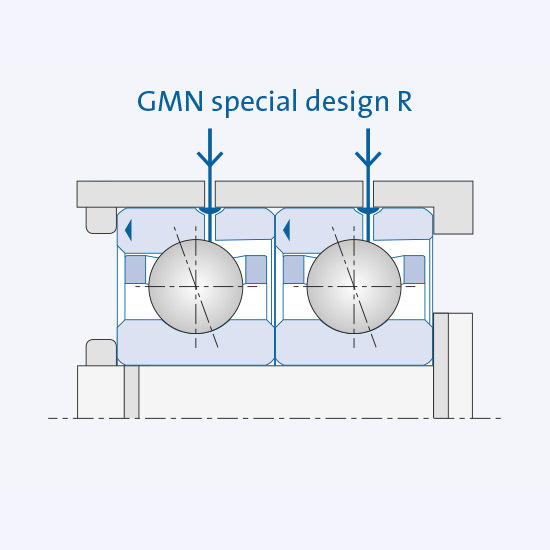 The specific key RPM value n · dm considers the operating-related RPM of the bearing, and refers to the maximum speed capability of the required lubricant. Consideration of key RPM values in selecting lubricants limits impacts on bearing performance due to lack of lubrication. A speed-dependent separation of the lubrication film can lead to mis-friction, heating and increased bearing wear. Many lubricant manufacturers offer a wide range of greases, which have been developed for use with fast-rotating or highly loaded ball bearings. By means of a requirement-oriented combination or processing of base oil, thickener and additives during the production process, specific properties such as wear protection, low-noise resistance or temperature resistance are specifically offered. You can find technical information about the topic of “Grease Lubrication of High-Precision Ball Bearings” in our download section. Consideration of the required lubricant duration is decisive for the long-term, reliable operation of grease lubricated bearings. The lubrication time can last more than five years under favorable operating conditions. Calculation of the lubrication duration (tf) is done by considering the lubricant’s characteristics and the operating bearing loads. Higher operating temperatures cause a reduction in the lubrication time. 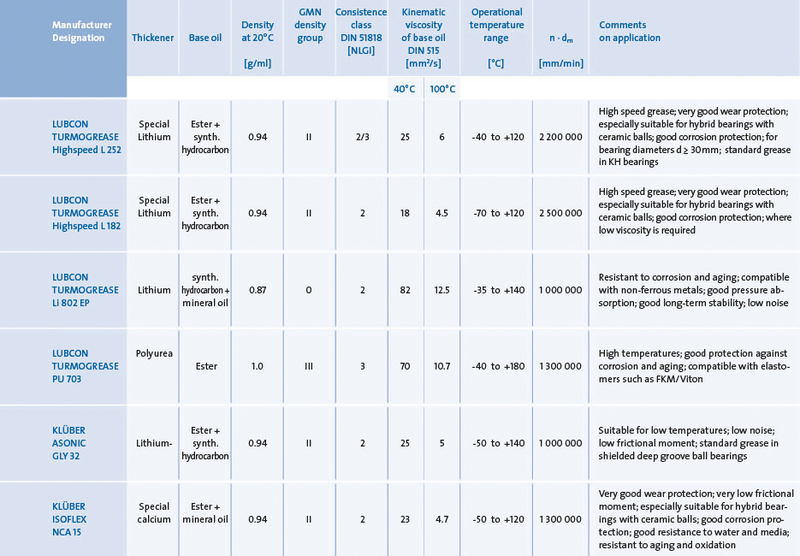 (From an operating temperature of 70°C, an increase of 15° Kelvin can halve the originally determined lubrication duration). For higher bearing loads (P and C> 0.1), shock loads, and vibrations, appropriate corrections of the lubrication time guide values (tf) are necessary. 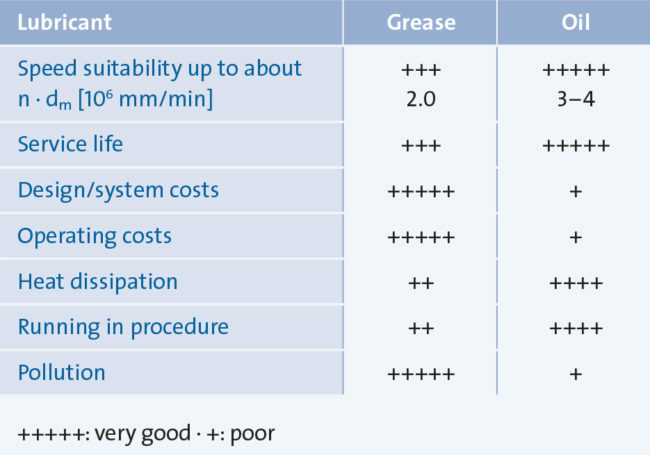 GMN recommends requirements-optimized special grease for extraordinary operating conditions. 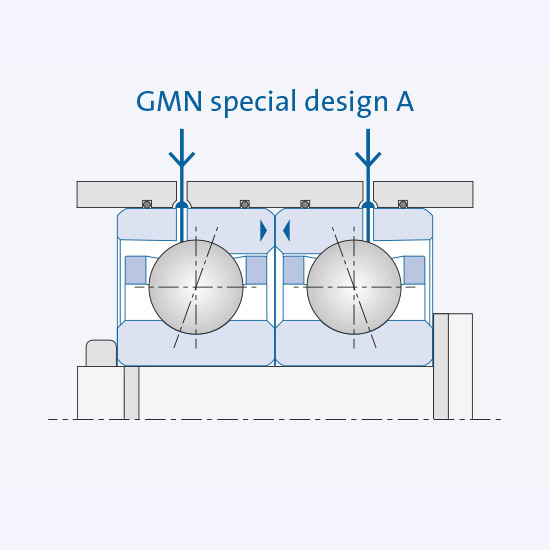 All GMN high-precision ball bearings can be delivered lubricated. Bearings without grease are delivered with standard preservation. 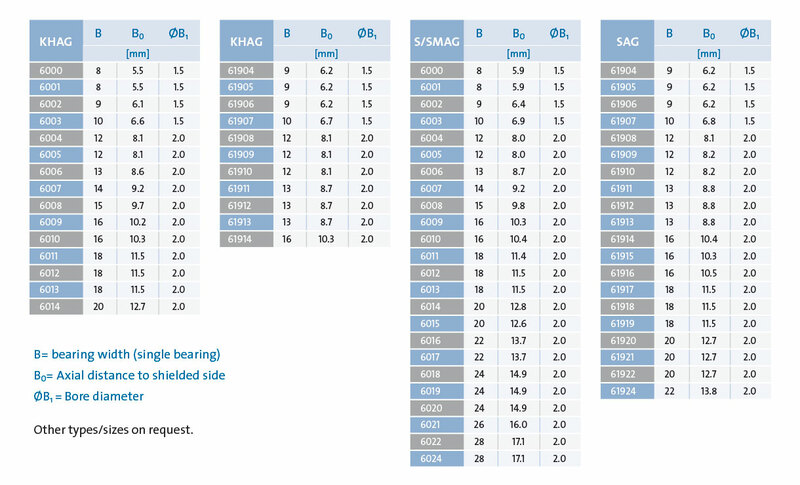 Series KH bearings have a standard grease volume of 25 % (LUBCON TURMOGREASE Highspeed L 252). Grooved ball bearings have a standard grease volume of 30 % (KLÜBER ASONIC GLY 32).Other greases are available upon request. Theoretically, a grease quantity of <10 % of the free volume of a bearing is sufficient for the lubrication. For most applications, however, a grease volume of 25 to 30 % is recommended on the grounds of safety and consumption of lubricants. 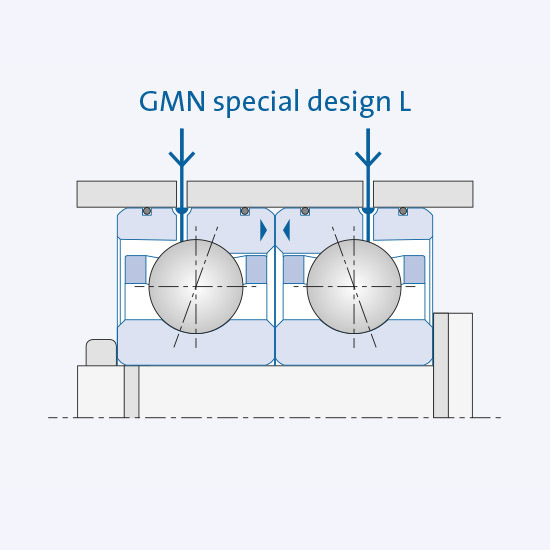 A guideline value for greasing GMN high-precision ball bearings with group I grease can be found in the relevant technical information sheets, or in addition to further technical information in our download area. Technical information sheet: “Greasing series 60 and 62”. Technical information sheet: “Greasing series 618 and 619”. Systems for grease lubrication are used if the grease service life or RPM suitability for permanent grease lubrication are not sufficient. bearing pairs in an O arrangement. 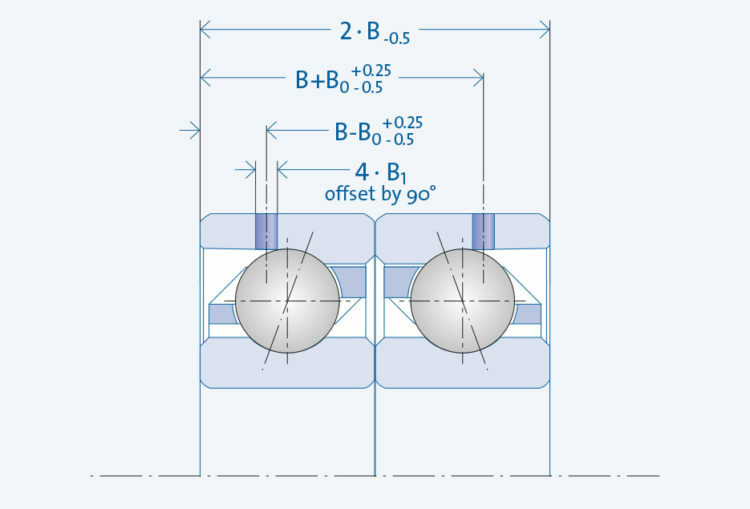 bearing pairs in a tandem arrangement. You can find technical information on “grease relubrication” in our download area. Further types and sizes upon request. In comparison to grease-lubricated bearings, the use of lubricating oils provides long-term, reliable operation at maximum RPMs. 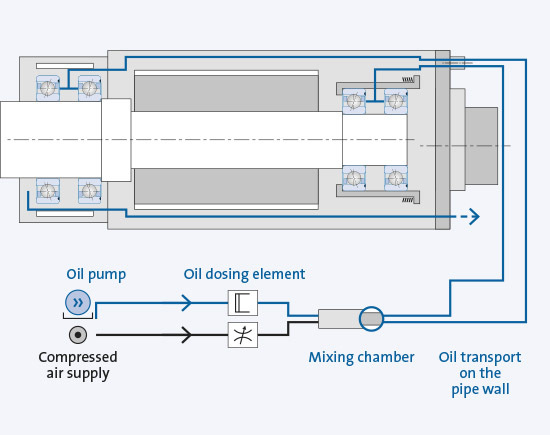 In order to provide oil to fast-rotating bearings, various oil-air lubrication procedures (minimal volumes of lubricant), oil injection lubrication and oil fog lubrication are available. Oil-air lubrication offers targeted and quantity-adjustable lubricant supply to rolling and sliding surfaces in the bearing. The lubricant is transported in an air stream in streaks along the inner wall of the see-through feed tube, and is fed in the required intervals evenly to the lubrication points. In order to ensure high quality from GMN high-precision ball bearings, we recommend our PRELUB electronically-controlled lubrication unit. This is not only recommended for our spindles, but also provides precisely controllable feed of the lubricant for effective bearing lubrication as well as maximum operating safety. In usual bearing lubrication systems, the oil injection nozzles are mounted in an in-between bushing or a spacer between 2 bearings. 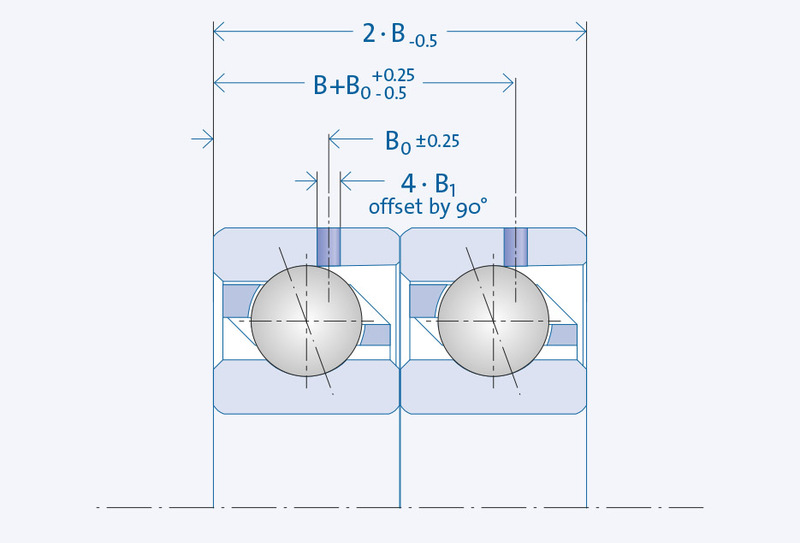 A nozzle position parallel to the spindle axis is sufficient for applications at high RPMs. 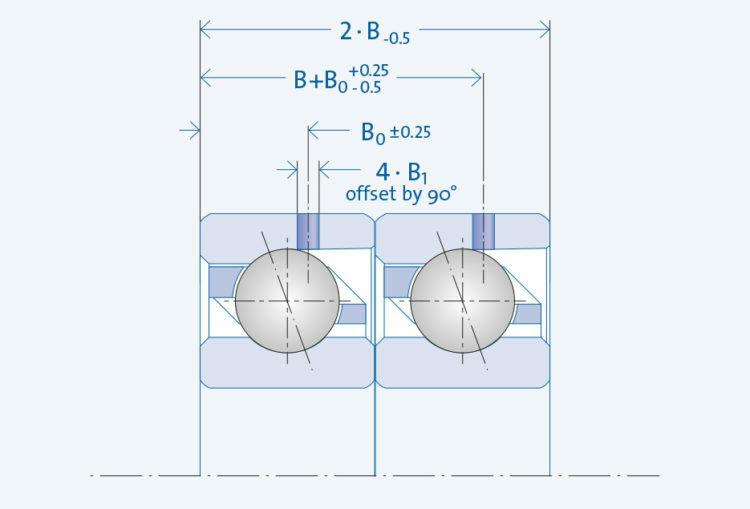 An angled nozzle position increases the RPM suitability for the bearing (more precise lubricant supplies in the roller area). 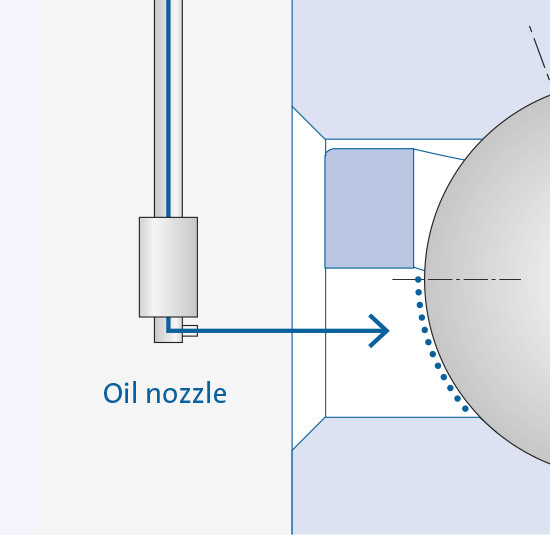 Sufficient lubricant feed is ensured with a ratio between the nozzle length and nozzle hole diameter of more than 3 and less than 5 (pressure of the oil-air flow is greater than the counter-pressure caused by bearing turbulence). Technical information about the “Oil Lubrication” topic can be found in our download area. 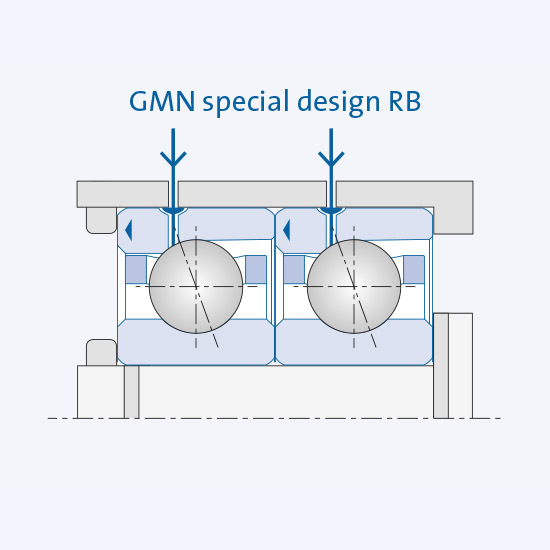 GMN special designs for direct oil lubrication provide compact bearing dimensions (through an oil feed hole in the outside ring (no space needed for oil feed), and also provide economical lubricant controls. 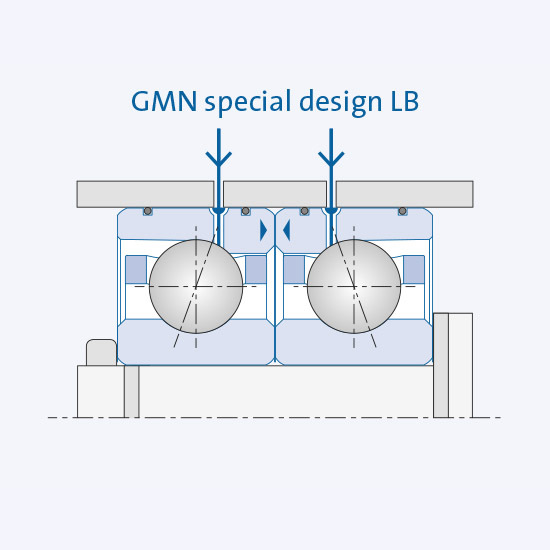 GMN special designs for oil direct lubrication offer versatile and effective solutions for oil supply and sealing. 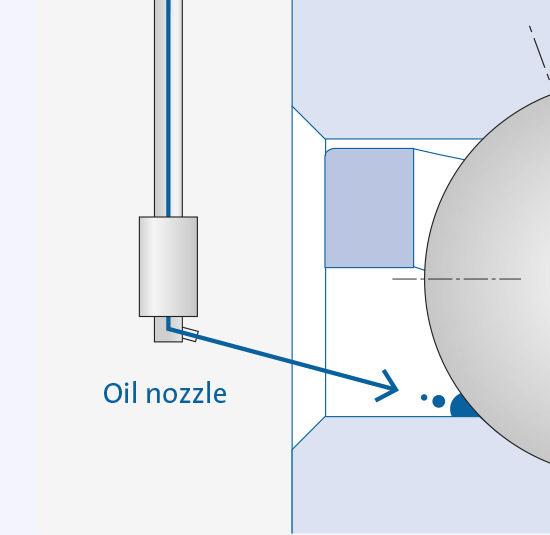 You can find technical information on “Direct oil lubrication via AR” in our download area. Mineral lubricating oils provide sufficient bearing lubrication for machine tool spindles.